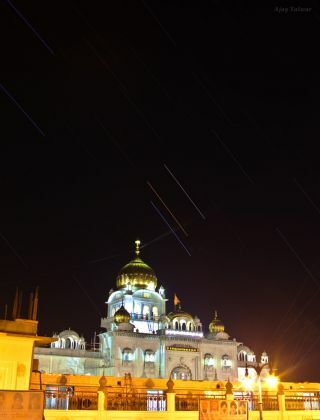 Veteran astrophototgrapher Ajay Talwar of The World at Night captured this photo of the star Spica and planets Mars and Saturn in August 2012 from the Sikh house of worship Gurdwara Bangla Sahib, which was originally the historic home of astronomer Raja Jai Singh located in downtown Delhi, India. The trails in the image are the result of more than 200 exposures of five seconds each. Mars, Saturn and the star Spica shine brightly over towering Sikh house of worship Gurdwara Bangla Sahib—originally the historic home of astronomer Raja Jai Singh located in downtown Delhi, India. Astrophotographer Ajay Talwar of the space photography group The World at Night took this photo in August 2012and shared it with SPACE.com this week. The trails in the image are the result of more than 200 exposures of five seconds each. "Monsoon time in Delhi often brings very clear nights, but they come unannounced and you can rarely plan for them much in advance. This was one of those rare clear and transparent nights of Delhi," Talwar said. "Transparent sky allowed (me) to capture many other stars, even with such a short exposure, not normally imaged from a location in downtown Delhi." Editor's note: If you snap an amazing photo of planets, stars, or any other night sky object, that you'd like to share for a possible story or image gallery, send photos, comments and your name and location to managing editor Tariq Malik at spacephotos@space.com.